At first glance, Alex Thomas is a typical 19-year-old: a teenager who loves fast cars and is majoring in public relations at Hofstra University in New York. But this is where typical ends and difficult begins. For the first eight years of Alex’s life, frequent hospital stays were necessary as he battled hepatoblastoma, a rare cancerous tumor that begins in the liver and affects only one in a million children. Cars were his connection to a normal life in that hospital bed. There he would watch movies and play video games about cars to pass the time. On his seventh birthday his uncle rented a Lamborghini Gallardo, his favorite car, for the two of them to cruise around town. The cars continued to be a constant in a battle that progressed – four more tumors, eight different surgeries and more than five years of chemotherapy. When Alex was just a young patient, another Alex – Alexandra Scott - was fighting her own battle against neuroblastoma, a cancer that develops from immature nerve cells. At four years old, after relapsing, Alexandra told her mom she wanted to host a lemonade stand to raise money to help other kids like her. Her first lemonade stand raised $2,000. The stand became a yearly tradition, eventually growing to a national movement and nonprofit called Alex’s Lemonade Stand Foundation (ALSF), that quickly raised more than $1 million to fight childhood cancer. That milestone was reached in 2004, just before Alexandra died at eight years old. Alex Thomas got well at the same age Alexandra Scott died. And while his story differed from Alexandra’s, they shared an experience: what it’s like to fight to live. That led him to get involved with Alex’s Lemonade Stand Foundation. 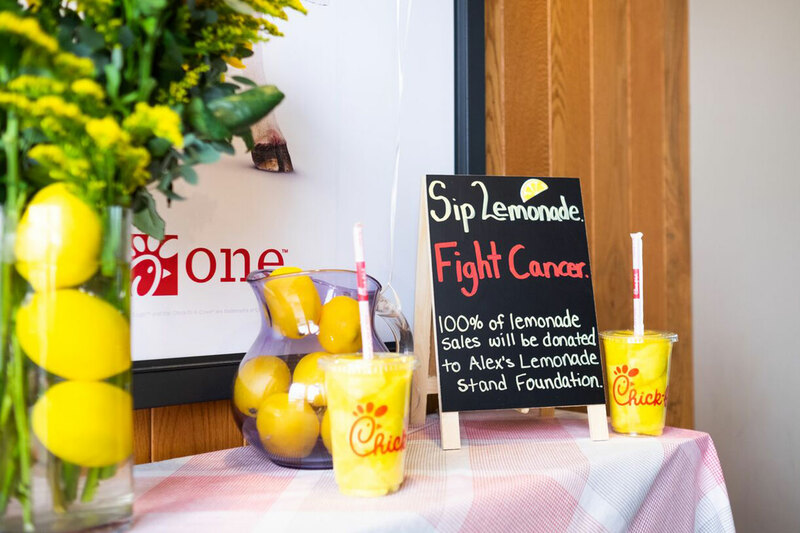 Alex’s Lemonade Stand has partnered with a wide range of corporations and businesses, large and small, in the fight against cancer, including Chick-fil-A restaurants. Since 2017, local restaurants across the country have raised nearly $60,000 for pediatric cancer research in partnership with ALSF, a cause dear to many Chick-fil-A franchise Operators and restaurant Team Members. In June 2017, Alex Thomas become an ambassador of ALSF, sharing his story with a room of 1,000 people and helping raise $35,000. That was when Alex Thomas realized that both his story and his struggle have power. He also realized something else – a lifelong passion had been replaced with a new one. On Sept. 14, Alex Thomas and his parents were honored as the “Hero” Family by the Chick-fil-A in Hicksville, New York, as part of the ALSF annual fundraiser events across the nation. There they were greeted by cheering Team Members, a Chick-fil-A Cow, a reserved table for three and, of course, glasses of Chick-fil-A Lemonade.